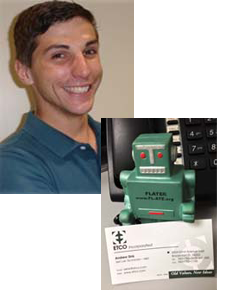 Andrew is currently working at ETCO Inc. as a Test Lab. Technician in their Research and Development department, and recently graduated from SCF with an A.A.S.E.T. Degree. He was nominated for Outstanding Graduate at SCF. “I was one of 5 nominated, and it was really exciting to sit on stage at the December, 2012 graduation ceremony” Andrew stated. Andrew continues his nonstop education; he has been formally accepted for the summer 2013 term at the University of South Florida, Sarasota-Manatee, majoring in English with a concentration in Technical Writing, and continues learning the Spanish and Basque languages. He has volunteered to help Jon Arias, a newly graduated E.T. student from the Basque country, during his internship in Florida. Andrew feels that “This trip was a life-changing experience, and I cannot express enough how grateful I am for all of the hard work, dedication, and selfless effort FLATE put into organizing and executing this trip. The academic knowledge I gained was first-class, and the cultural knowledge was something that I don’t think I could have ever gotten to experience on my own. Staying in the Basque country was such a great experience. The skills I learned at SCF and during my training in Spain enabled me to get a job in the electronics field almost immediately; and the hands-on lab exercises were extremely beneficial to me”. He credits both his program and his instructors: “The ET program here at SCF has given me the skills and training I needed to get two jobs in the industry, and I wouldn’t have gotten either of them without my time at SCF”. Christopher found this HCC degree program online, and is “the type of person to work with electronics, machines, cables, and so on. This program will help my career because hopefully it will open the doors to jobs and future opportunities for me and family.” When asked about favorite aspects of the program, he responds, “favorite courses always have something special because they make me work harder and pay more attention to the materials I am learning about. Lab exercises always help put in practice whatever lectures we go through in class. Labs are fun and a very important aspect to learning more.” Christopher puts his enthusiasm into practice as he travels to Spain this summer to study with the Iberian Partnership for Technician Excellence. Jim Merrill, a proud ex-marine recently completed his A. S. engineering technology degree with honors, also received two college credits certificates, one in engineering and one in alternative energies. In addition he obtained his photovoltaic entry level certificate. “I feel that today’s Engineering Technology has become a multicultural worldwide endeavor, I was able to incorporate our trip to Spain that allowed me to accomplish these things and finish in December 2012”, expressed Merrill. Jim finds that the lab work is very important in the academic parts of ET classes because only real hands on practice enabled him to better understand his career. 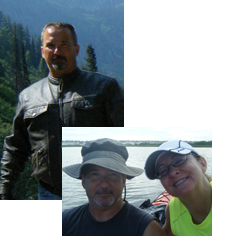 On January 25, 2013 Jim got married and moved to Kirkland, east of Seattle and currently hi is searching for a job. Kelly is planning to obtain her A. S degree in engineering technology this year. She started the ET program as an assembler working for Harris Corporation, now she has moved up and is working in an aerospace program. “I finally found the career that I really enjoy. With the knowledge and experience gained in the ET program and the training in USURBILGO Skola in Spain, I have grown as a person and as a student feeling more confident in my career and future job opportunities,” expressed Andino. Harris Corporation brings Brevard Community College ET classes on site to help support their employees in career advancement.